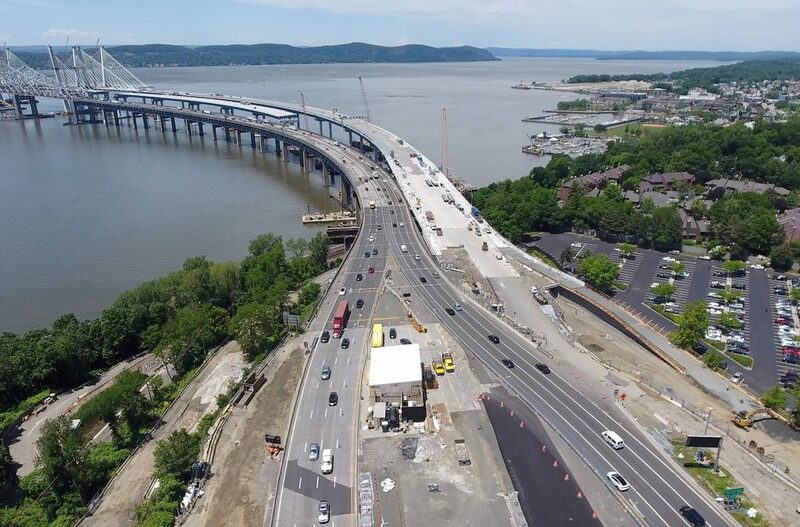 The New NY Bridge, a $4 billion replacement of the Tappan Zee Bridge across the Hudson River 30 miles north of Manhattan, is expected to partially open to traffic on Aug. 25. The New York State Thruway Authority and Tappan Zee Constructors, LLC, began building the 3.1 mile, state-of-the-art, twin-span replacement in 2013. The Tappan Zee Constructors team includes ARTBA members Fluor, Granite Construction, American Bridge and Traylor Bros. Inc. The cable-stayed span crosses one of the widest parts of the Hudson and is the largest bridge built in New York State. A total of eight lanes on the first span will open in a temporary traffic pattern on the bridge, also called the Mario M. Cuomo bridge for the former governor and father of current Gov. Andrew Cuomo, but initially only four northbound/westbound lanes will be open to traffic. The southbound/eastbound lanes are slated to open this fall, and the entire project is set to be completed in 2018. The New York State Thruway Authority is posting details about the bridge opening and traffic shifts on its website. Motorists will be advised via electronic message signs in the region.